This is a book case and lecturn all in one. I find that when studying I can concentrate for longer while sitting crossed legged than when in a chair or sofa for example. But I find it tiring to hold a book open on my lap and it also gives me a neck ache looking down all the time! 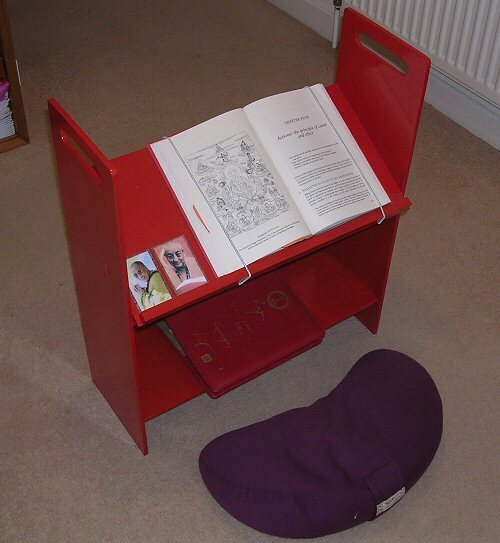 As a result I made the following study aid inspired by something similar I saw at the 2006 Rigpa Easter Retreat at Haileybury College (used in the daily practices). Study books and texts can be stored on the bottom shelf while the current text can be left opened on the slanting shelf. I use elastic threading to hold the pages open. This means I can sit crossed legged, reading the texts and study for hours with less fatigue. All the wooden pieces are made from HDF and fixed with counter sunk screws and wood glue. The two side pieces are ca. 60 x 20cm and the slanting shelf has dimensions 50 x 25cm (slanting 15cm from top at the back to 25cm from the top at the front) . The bottom shelf has dimensions 50 x 18cm with a 5cm back shelf (8cm above the floor). All parts were assembled and painted with undercoat and red paint.